Finally, Minecraft will harness the awesome power of Microsoft’s Xbox One and Sony's PlayStation 4. OK, so it’s not like open-ended construction game needs the next-generation horsepower of an advanced, first-person shooter like Titanfall. Even Mojang, the company behind Minecraft, made fun of its announcement on Thursday. Minecraft doesn't rely on photorealistic graphics to hook gamers. Instead, it lets players build immersive worlds out of blocks. How addictive is it? Someone took the initiative to build a virtual model of the entire country of Denmark. 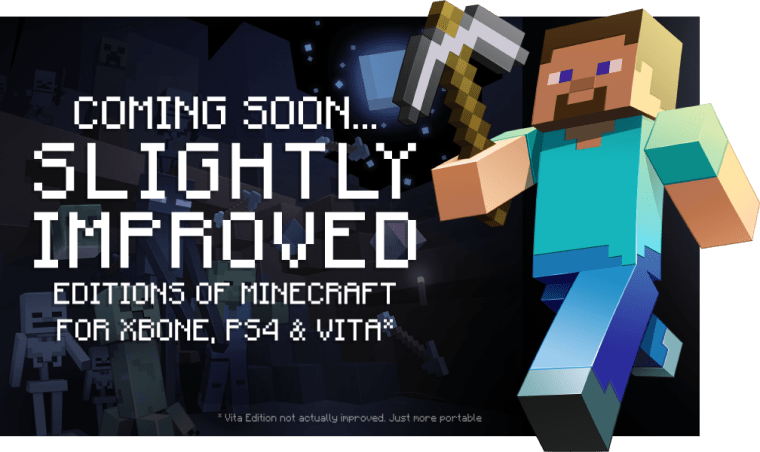 The Xbox One and PlayStation 4 versions of Minecraft promises "significantly bigger worlds and a greater draw distance" than the games released for the Xbox 360 and PlayStation 3. That is pretty much it when it comes to improvements. People who bought the old versions, however, will get to upgrade for only $4.99. A new version of the game for the PlayStation Vita is also being released. Minecraft fans will be able to pick up each game in August for $19.99.